 Makes a lovely addition to your beloved girl's wardrobe! Looking for a gift for a newborn baby or toddler girls Makes a great Baby Gift or Baby Hamper! Joymom has the comfort and style you crave for your baby girl. Hurry and pre-order today! Thank you for viewing the above featured listing, please visit again soon.. Dress material is breathable and skin-friendly. Besides, Its light weight makes your little girl feel light and bright when wearing it. Neat stitching and exquisite shaping makes the garment look tidy and greceful. Solid & slim fitting style gives an impression of incredible elegance and simple fashion. It is appropiate for wearing it on formal or imformal occasions. 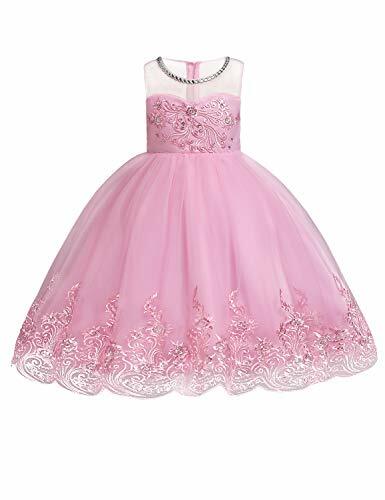 The beaded neckline, emboidered pattern spice the whole dress up, making your beloved girl be an applause and compliment receiver, and also the amazing belle on the ball.